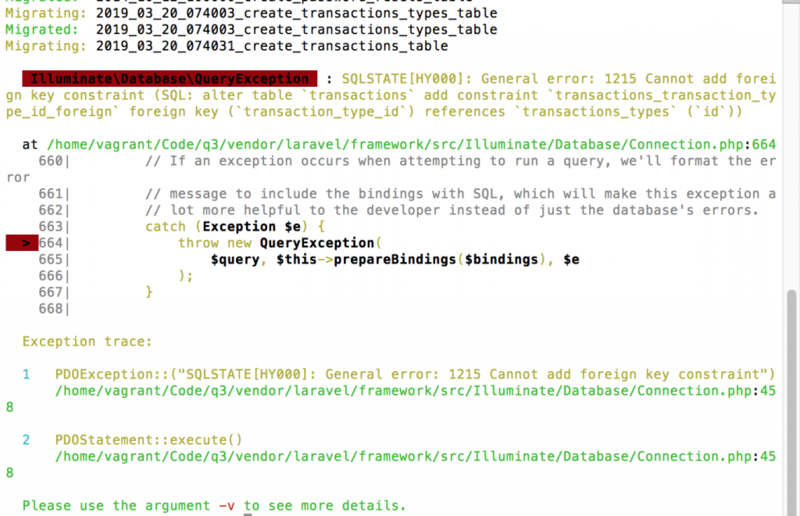 There is one change in Laravel 5.8 that is not mentioned in the official Upgrade Guide but caused me problems – I couldn’t create a foreign key migration, and spent half-hour until found out the reasons. So I want to share, maybe you will encounter the same thing. Typo in table name? Double-checked, nope. Too long foreign key name? (should be up to 64 characters) Doesn’t seem so. bigIncrements. BIG increments. And then, of course, if you’re doing a foreign key from just “unsigned integer” type (as I always did my whole life), it fails. Type mismatch. Obviously. Or in your foreign key column do bigInteger() instead of integer(). Simple – this change wasn’t mentioned anywhere in 5.8 changes. Official 5.8 Upgrade guide? Nope. Well, ok, it doesn’t affect the project during upgrade specifically, so maybe it’s fair. Laravel News official blog: main announcement by Paul Redmond? Not a word. Same blog: maybe one of the articles about 5.8? Nothing there either. So, it makes me think that probably it’s only me with this problem, and everyone else will actually notice that migrations are being generated with bigIncrements(). After some googling, I’ve found one Reddit thread and one Stackoverflow post about it. That’s it. Don’t get me wrong, I’m not against that change to bigIncrements(). I’m just angry about how it was (NOT) communicated. Probably only a bunch of people participating in internal Github communications actually knew about this change. So whenever you create new fields with foreign key to users, don’t forget to use bigInteger(). I had no problems, I always use bigIncrements, but thank you very much for the advice Povilas. Took me a while to figure it out too! I guess we should be start using bigIncrements then…. Funny enough. I went for an interview and part I was to develop and app and that was the first time I was working with Laravel 5.8 . I had same error as you and that really wasted my time trying to debug. I think that change should have been communicated. That can definitely catch you off-guard if you’re not looking out for it. Shouldn’t the foreign key be specified as a “unsignedBigInteger” since “bigIncrements” reflects a column of type UNSIGNED BIGINT? Yesterday took me like 2-3 hours to figure out this. I just started working with laravel 2 weeks ago and I thought I was doing something else wrong..
Hi! It’s nice article! But I didn’t solve this error. How to avoid TokenMismatchException on logout?